The El Rey Apartments located in San Rafael were constructed in 1929. Similar to many San Francisco apartment buildings of the era, it is of the Mediterranean Revival architectural style. 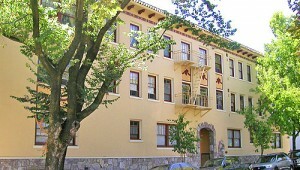 It is known as Marin’s first luxury apartment building. The architects of this handsome structure focused on the fine details, including the ornate lobby, decorative exterior molding and ceramic tile roof. The property owners commissioned SF WiFi to design and install their new wireless network. This project entailed saturating the property with signal for tenant apartments and common areas. Our wireless solution provides superior coverage, ease of use management features to seamlessly support today’s mobile user. Download the SF WiFi Support App today to schedule a site survey, to improve wireless coverage at your location.